I have always loved ice cream. Once in a while, back in the 1950's and 1960's, on a hot summer night Dad would take us for a car ride. Forty minutes north from our home in Northeast Philadelphia was Langhorne, PA -- home of Greenwood Dairies! Greenwood was famous for their huge portions; a "single" was actually about a dozen regular scoops crushed together into something huge -- the size of a cantaloupe? Imagine a little kid with an ice cream moustache, dwarfed by his cone with one or two "Greenwood" scoops piled on top! Years later, my friend Eddie occasionally got the keys to his father's Rambler. John, Neil and I would pile in for the drive up U.S. Route 1. I was now able to handle a three-scoop cone or one of their giant sundaes. Neil was another ice-cream chowhound, but Ed could manage only normal portions. My cousin John had a big appetite but he didn't like ice cream, choosing their pretty-good Philly steak sandwiches instead. There's not a whole lot of information about Greenwood on the Internet, not even a photo of the old building. 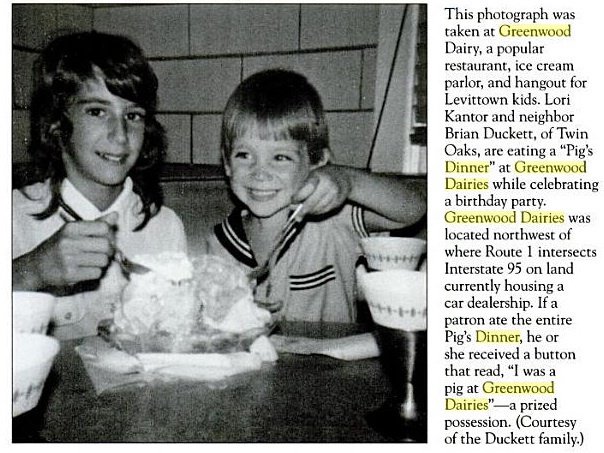 I discovered that the dairy closed in 1985, followed by the restaurant two years later. One person remembers that his parents surprise-ordered a Pig's Dinner for him when he was ten years old! Now, if you go back to the previous blog posting, you'll see a photo of me in a burger eating contest at Boomerangs. This proves that I'm a multi-disciplinary pig, capable of consuming mass quantities of many things including beef burgers, ice cream, and beer! i was a pig numerous times during the 60's. A fantastic place. Great ice cream. Hi George! 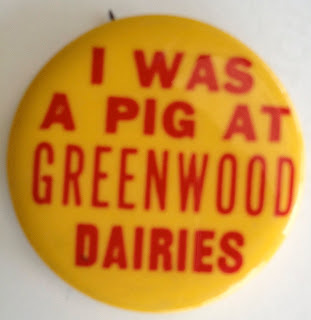 My next-door-neighbor has often reminisced about being a pig at Greenwood Dairies. As you were a pig more than once, any chance you came across a second one of those buttons... that you might part with? I would love to be able to give one to my neighbor. Where was the picture of the milk truck taken? When was it taken? 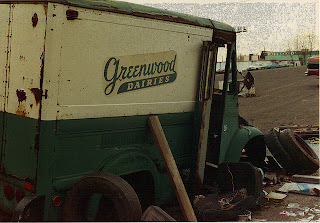 I was a milk man at Greenwoods for a while. It was a great place to work for kids. Sorry Sondra that's the only "Pig" button I have. Could you print out this photo and glue it on top of another pin? Roy I came across that picture of the milk truck with a Google search. Yeah, I remember seeing the same kids working the dining room and take-out counter year after year. That is not a picture of the "Pig's Dinner". It was served in a wooden trough and was much bigger than that. I remember it so well! If memory serves me right, a pig's dinner had 13 scoops of ice cream. I never knew anyone that could polish one off. It was a real treat to go there in the 60s. 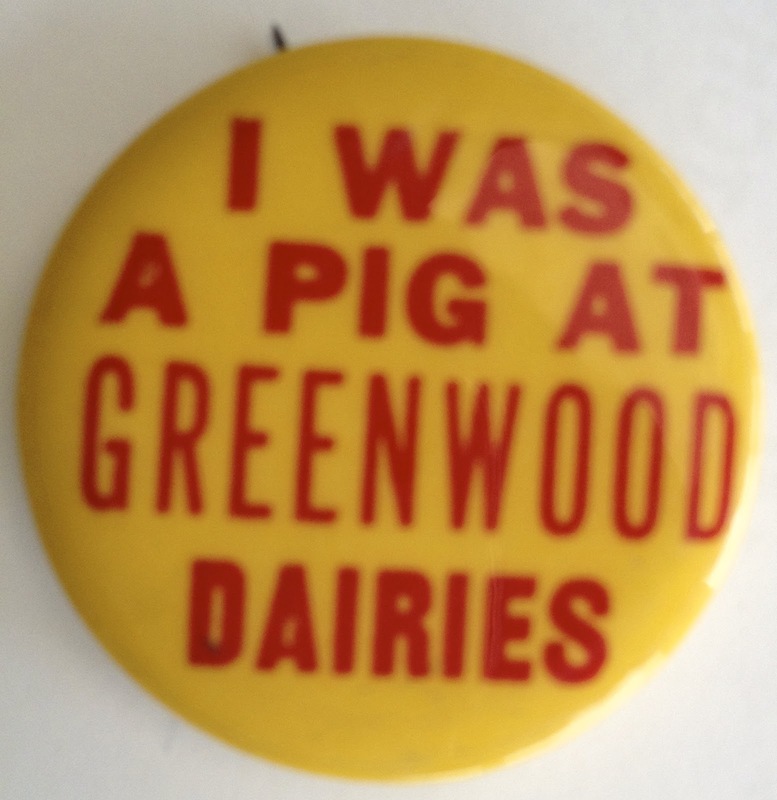 Diane & Kathleen are correct, in the 60's I ate quite a few of the Pigs Dinners, and did have the buttons. The trough was about 12" long, and they gave you a big spoon to use. As a teen, I used to go there most Saturday Nights after going to Hiway Pool, and the Go Carts. Remember those ??? I ate hot fudge sundaes my choice they came in a quart carton .it was 1966. I was hoping they survived I am ready to drive from Alabama to renew my love affair. "Monsters of the Amazon" wins awards!